Mohajeri, A., Fallah, M., Hosseinzadeh Lotfi, F. (2014). Carbon Based Closed-Loop Supply Chain Design under Uncertainty using an Interval-Valued Fuzzy Stochastic Programming Approach. International Journal of Research in Industrial Engineering, 3(3), 24-48. A. Mohajeri; M. Fallah; F Hosseinzadeh Lotfi. "Carbon Based Closed-Loop Supply Chain Design under Uncertainty using an Interval-Valued Fuzzy Stochastic Programming Approach". International Journal of Research in Industrial Engineering, 3, 3, 2014, 24-48. Mohajeri, A., Fallah, M., Hosseinzadeh Lotfi, F. (2014). 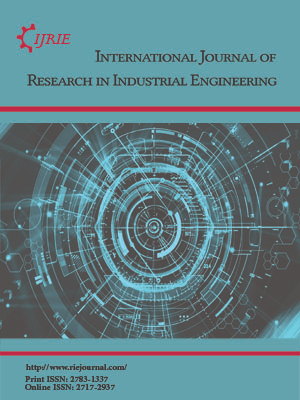 'Carbon Based Closed-Loop Supply Chain Design under Uncertainty using an Interval-Valued Fuzzy Stochastic Programming Approach', International Journal of Research in Industrial Engineering, 3(3), pp. 24-48. Mohajeri, A., Fallah, M., Hosseinzadeh Lotfi, F. Carbon Based Closed-Loop Supply Chain Design under Uncertainty using an Interval-Valued Fuzzy Stochastic Programming Approach. International Journal of Research in Industrial Engineering, 2014; 3(3): 24-48. Recovery of used products is receiving much attention recently due to growing environmental concern. In this paper, we address the carbon footprint based problem arising in closed-loop supply chain where returned products are collected from customers. These returned products can either be disposed or be remanufactured to be sold as new ones again. Given this environment, an optimization model for a closed-loop supply chain in which the carbon emission is expressed in terms of environmental constraints, namely carbon emission constraints, is developed. These constraints aim at limiting the carbon emission per unit of product supplied with different transportation mode. Here, we design a closed-loop network where capacity limits, single-item management and uncertainty on product demands and returns are considered. First, the fuzzy mathematical programming is introduced for uncertain modeling. Therefore, the statistical approach towards possibility to synthesize fuzzy information is utilized. So, using defined possibilistic mean and variance, we transform the proposed fuzzy mathematical model into a crisp form to facilitate efficient computation and analysis. The model is applied to an illustrative example of an uncertain green supply chain (GSC).